Here is an actual recording of Anonymous leader Gregg Housh’s last court hearing where he basically admits to committing criminal acts against the Church of Scientology in Boston. Judge Horgan is asking him to admit to certain facts and criminal acts and of course Gregg freely admits to them. Anonnewswire has just informed the public that WhyWeProtest.net has got some serious issues. Liek serious issues. Liek OMG! We are working on the issues at hand. I think Poppins has some issues. &lt;unknown&gt; in ?, line ? BOSTON – A Woburn, Massachusetts man (Gregg Housh) was ordered to stay away from the Church of Scientology of Boston for one year after admitting he disrupted religious services there in February 2008. In the Boston Municipal Court, Gregg Housh, 32, admitted to facts sufficient to warrant a finding of guilt on charges of disturbing the peace and disturbing religious services for leading a February 10, 2008 disturbance at the Boston Church of Scientology. Housh’s case was continued for one year, the terms of which include a court order to stay away from the Church of Scientology of Boston’s locations in the Back Bay and the South End. 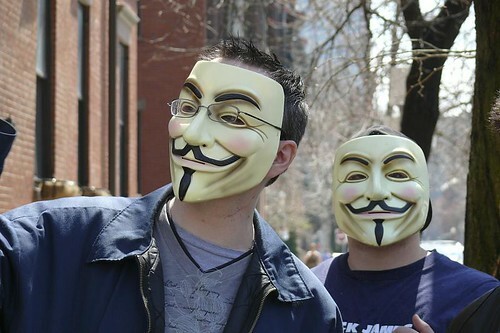 Housh is the self-proclaimed leader of the Boston cell of an underground cyber-terrorist group called Anonymous. He is the second member of Anonymous to face criminal charges in the past week for acts committed against a Scientology Church. On Friday October 17th, The U.S. Department of Justice announced the filing of federal criminal charges against New Jersey Anonymous member Dmitriy Guzner related to the January, 2008 attempted destruction of websites owned by the Church of Scientology. Guzner has agreed to plead guilty to felony charges that could send him to prison for ten years. At the October 21 hearing, Boston Municipal Court Judge Thomas C. Horgan warned Housh that if he violates any of the terms of his probation he could face one year in the House of Correction. A Los Angeles Superior Court Judge on Friday, October 24, 2008, issued a restraining order against Donald Myers, a member of a cyber-terrorist group known as Anonymous. The order requires Myers to stay at least 50 yards away from a female Scientologist he stalked and harassed. The order also requires Myers to stay away from the L. Ron Hubbard Life Exhibition at the Church of Scientology International building in Hollywood where the victim works, and stay 50 yards away from the woman’s home. The restraining order lasts for 3 years unless renewed. Myers was found to have engaged in acts of harassment against the young woman, after video evidence was submitted to the court showing Myers stalking her, taunting her with sexual slurs, and refusing repeated requests to leave her alone. Myers was also ordered by the court to turn over any firearms in his possession to the police. This is the second restraining order issued against a member of Anonymous this week. On October 21, a Boston Court ordered self-styled Anonymous leader Gregg Housh to stay 100 yards away from the Boston Church of Scientology. Housh was placed on probation for one year with the threat from the Court that if he violates the restraining order or any other law, he faces a year in prison. Anonymous has been implicated in numerous criminal acts, including bomb threats, death threats, vandalism and computer crimes which are being investigated by law enforcement. On October 17, The U.S. Department of Justice filed federal criminal charges against New Jersey Anonymous member Dmitriy Guzner related to the January 2008 attempted destruction of websites owned by the Church of Scientology. Guzner has agreed to plead guilty to felony charges that could send him to prison for ten years. You are currently browsing the archives for the Gregg Housh category.